So, after being chased by thunderstorms across Nebraska, I arrived back home around 3pm yesterday afternoon and soon sat down at my computer to try and catch up with my f-list and lj friends. I had a wonderful time with my cousin and her daughter and son-in-law, we went all over Lincoln which I had remembered as a very nice city and which confirmed my college memories. I ate far too much and will be watching what I eat carefully over the next week or two to get back to reality. Of course, my birthday will interrupt the good thoughts of weight loss, but most of this should be gone in a few short days. 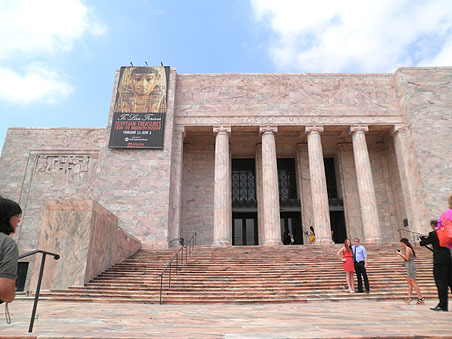 We traveled to a lot of different places, but one of the nicest was to the Joslyn Museum in nearby Omaha. They were hosting a special exhibit called "To Live Forever - Egyptian Treasures from the Brooklyn Museum". The building all of this was housed in was a wonder of Art Deco - classic and stunning. Everywhere I turned were the details that make Art Deco one of my favorite art styles. Here is a look at the building facade. My cousin is at the far left, but I'll have other pics later in the week. There is a similar frieze on the right side of the entry steps. The marble is Georgia Pink marble, warm and welcoming. It is fronted by a sculpture garden which continues into a more childlike sculpture garden on the north side. Admission is incredibly inexpensive and they have a cafe that served some of the best food I've had in a museum for a long time. I'm going to focus on the art deco features of the museum for this post. 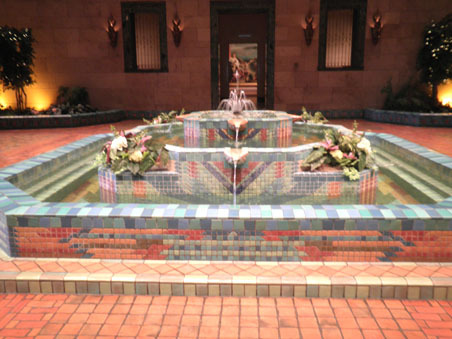 The tile fountain is a feature of the main floor central court. It is surrounded by brass lighting fixtures in rippled and cutout brass. 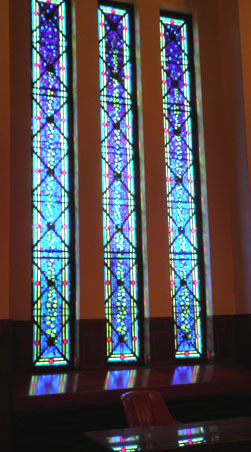 The stained glass windows were in the Founders Room, a gentle rest room with chairs, couches and desks, a large fireplace, and these stunning windows. 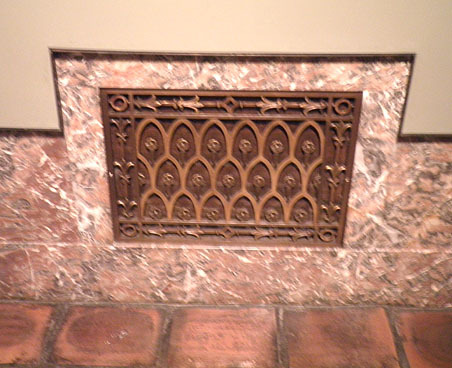 Throughout the galleries were these art deco grates. This particular one hid a cast iron heating unit. Just beautiful. Current Location: Looking forward to routine! Glad you escaped the storms. What a lovely building - the colours are so welcoming. It's quite an amazing place. I think I'll spend one or two more posts on it before getting to the rest of my trip. You've been warned - LOLOL. What marvelous architecture! it sounds like a fun trip. It is an amazing building. I was the slow one going through the exhibits. My cousin and her daughter always seemed to end up waiting for me and I actually rushed through it, comparatively speaking - LOL. What a wonderful adventure! I'm so glad that you had a good time. Pink marble... almost invites a place in a story. Sounds like a museum I'd like to see - but I'm not willing to drive eleven hours to see it. I will get my eleven hours in twice taking youngest to her college orientation in Ithaca, New York. The buildings aren't much to look at, but the gorges are awesome! Yes, eleven hours is a long drive. Ithaca NY, huh? That's really great for her. I hope all goes smoothly for your upcoming trips.